I'm in love with sunshine, bird song, Spring, my husband, my little cabana (Cedar Kottage), paints, shells, sand, soil, plants, flowers, the air, Cedar Key and more ... so much more! I can't believe it is mid-February already, and remember not so long ago when I felt encapsulated in time in a dark, dusty house (that seems so expansively large to me now), pinging from window to window like some lost particle in space pondering how anything could endure such a dreadful, void season. I never dreamed (or even wanted just a little bit) of a Florida migration. I never dreamed I would love Florida. But who wouldn't love the meaning of the word, "flowery Easter?" Things change. I am up in the air these days without a compass. My sure footed path of what I want has been overgrown with new ideas and possibilities. I was so sure of my path in life and now, well I'm certain of change. Things change. Sometimes for the better. Usually for the better. Mostly for the better. It will all work/flow out. I sometimes wonder if we don't really have a say in what happens to us as much as we try to plan and set goals. If we do, however, have a say in what doesn't happen to us and that is how we move bumbling forward. We can say no to this, no to that and eventually we reach a resounding yes of this is what I want, that a thousand "nos" eventually puts us on the path we were meant to follow. Today I mourn the death of the NNY Art Trail. While I believed in this incredible idea that was born and placed before me, this idea of uniting all the artists of North Country on a map and in a shiny, glossy brochure so that the visiting outside world could see a trail of talent splayed across three counties, there comes a time when one's energy is burned more effectively in a different fire or idea. In its first year, my partner tirelessly contacted artists, arts organizations, news organizations and sold to them all the benefits of having such a trail. An enthusiastic 50 artists and an impressive number of sponsors joined the Trail as a result. This year when asked to renew, we received a scant over 20 artists' participation and only a handful of sponsors. Guess that Trail blazed out? Do we really have to spend that kind of initial energy again to keep the fire stoked? Too much. We have collaboratively decided, even without the investment of long term momentum and stick-to-it-ness, to retire the Trail. I am admittedly, relieved in one sense only because pulling together the web site and the graphics for the brochure and map was/is a ton of work! In another sense I would have liked to attempt to morph into something of a different animal that may or may not have worked — perhaps simply an online directory with a minimal membership fee but how does one keep feeding that idea flame, and what about all those computer-avoiding-art patrons out there who wouldn't care or even know how to look it up online and well ... collaboratively deciding are the key words here. The idea was born, it lived but didn't quite thrive in a year's time and now it has burned out because the universe keeps moving forward. It is change, certainly, and is probably good/better in this way. 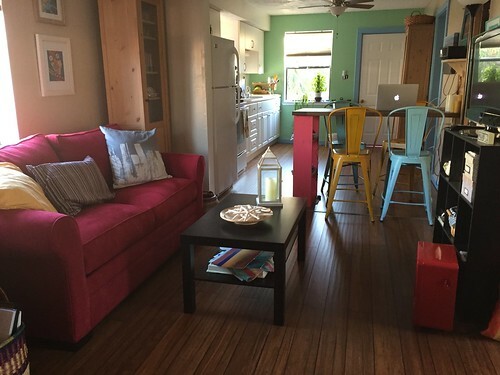 It is now energy I can spend on the Violet Fern Art Studio & Garden for which I can always be grateful to the NNY Art Trail for spurring me into action. The birth of the Trail is what made me step up my game to pursue art full time and create some sort of viewing venue on my property in Clayton however unlucrative that is right now. Funny how all those things, even those that burn bright and expend, lead into something and into now. In my new state of "airness," I am wondering if, in a strange and unforeseen twist of my life's path, the lake (way up North) will become/is now my time of peace and painting and if the Violet Fern Art Studio & Garden enterprise will be rebuilt — bionic — here in Cedar Key? If the Trail, even in expenditure, has in some way directed me to here? If my venture will gradually, naturally migrate here through a series of "nos" and turns over the next few years? I love, love, love my garden paradise in Clayton, NY, but can I even begin to convey to you how excited I am to garden in zone 9a??? I mean I just ordered a Brugsmansia to plant in the ground! 'Charles Grimaldi' to be specific. I imagine swinging in my hammock chair (which is the coolest but I've yet to hang), above my coral-painted porch (which I've yet to paint), reading a book (especially about gardening or perhaps even about painting which I find difficult because I just want to stop reading and keep trying), with these amazingly large, drooping, trumpet blooms (mind you, I have yet to even plant Charles), dripping down around me intoxicating me with their fragrance — in spite of all those "yets," I can almost taste it! Yes, you could grow this beautiful Brugmansia in a large pot in the North and then cut it back (gasp) to cool over the winter in a sheltered area but to me, there is just something magical about growing a plant like this from the ground up! The porch in its current state: saw station. 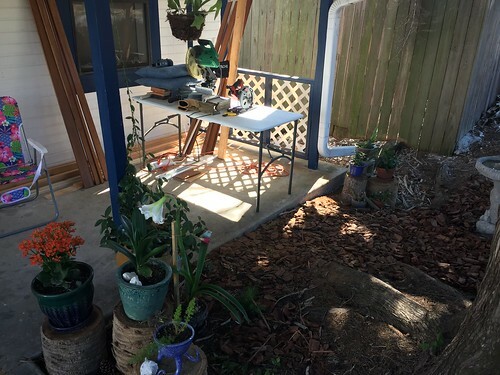 But I imagine that Brugmansia in that little patch of filtered sun there with big floppy blooms and the hammock chair where the saw table is now and the cement painted coral. I also have my own little grove of fruit trees! Mucho more love. 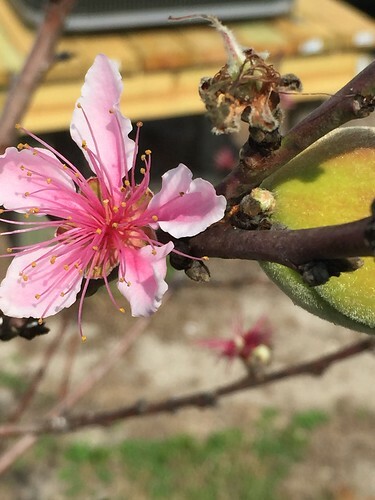 There are peaches blooming right now! I am on a bit of a learning curve here and just ordered some organic fertilizer for the trees but ideally I should have fertilized before flower and fruit production. From what I've read February is a good time to prune. From what I've discussed with local folk, pruning after fruit harvesting is a good time, too. Fertilizing is a must here due to well, sand. A compost pile, or impending drumlin in my case, is not a good thing here as the entire jungle of plants in the nearby vicinity will root their way over to it. A better way is for me to dig a trench near my peach tree, empty my compost bucket into it, and cover it up/bury it. I worry about digging into roots but well trench composting it is because I have an active imagination of drooling, toothed, carnivorous roots finding their way to my compost pile. Peach and peach blossom in the "grove"
I hope to make a nice crushed shell path down the center of the grove by lining up bricks and filling in between, ending in a circle punctuated by a large sculptural bird bath. It is just what I "see." 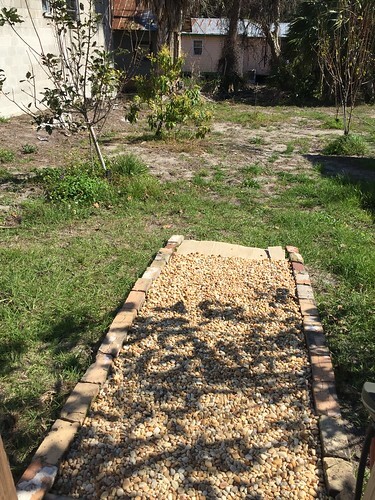 I have started the path with some bricks I found buried on the property, the learned cardboard trick to kill the grass, and some rock pebbles I purchased in bags at the little hardware store here (an expensive way to go vs a truckload of crushed shell!). The start of a path through the "grove." Eventually I hope to mulch beneath all the fruit trees on either side. You know how I feel about lawn. There are peach, plum, apple and even avocado! ​to the back deck (painted bright sea foam). A glass door to the deck is on order so we can see outside. New bamboo floors. 'Elizabeth' tucked in next to her is a coleus I rescued from the Park (where I worked) that broke off. 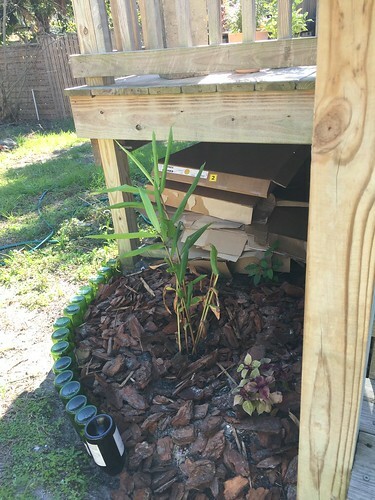 ​Under the deck a stash of cardboard from moving — cardboard is a gardener's friend here in FL! 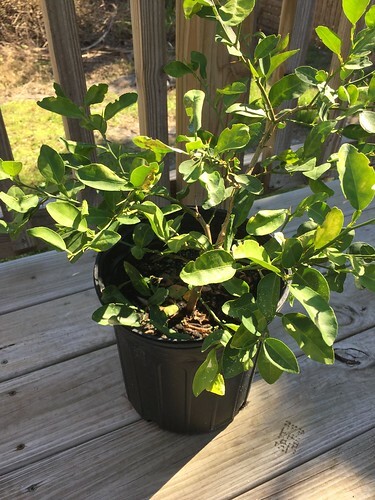 On my schedule today is to plant a key lime tree — I just LOVE that I can say that! We were in the tiki bar one evening and got to talking to a man named Wiki who just happened to have a few key lime trees for sale down at Annie's Café where we like to go for breakfast every now and then. He must have enjoyed talking with us because he told us to pick out any tree we wanted as a housewarming gift — what a great guy! Key Lime Tree most likely Mexican or West Indie Lime. It has thorns and will grow up to 13' tall and wide. So you can bet I will be taking care of that little tree with all I can muster. 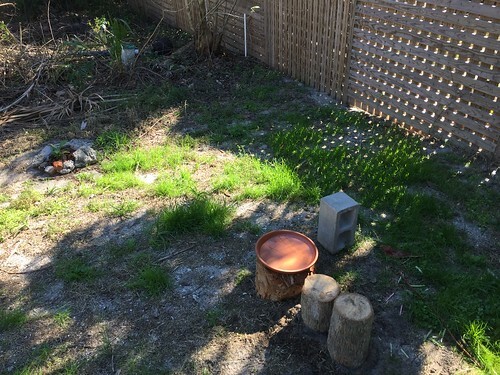 It's not much of a garden now but he will go where the cinder block is marking the spot. I am collecting palm tree stumps to line a large future planting bed out back. They are pretty easy to come by if one keeps her eyes open for sidewalk lawn debris pick ups. One is a makeshift bird bath on the fly. To the left, surrounded by rocks, is a little Loquat Tree I grew from seed — though they do not grow true from seed — over the summer in my greenhouse up North. Loquats, or Chinese Plum, are a good ornamental tree, though not native (neither is the key lime). They have large glossy leaves and sweet fruits (hopefully mine will). I see them growing around the neighborhood and their panicles of flowers always seem to be loaded with bees and overwintering Monarchs. I have learned from my mistakes in making the Violet Fern Garden up North. We will have a fence lining the back of our property similar to the one of our neighbor's pictured, straight away. I will be leaving a wide path along the sides of the house open for painting, maintenance, and access, and it is already lined with clam shells. Something I truly wish I would have done up North only with pea gravel or pebbles.